ADEN (Reuters) - The Saudi-led coalition fighting in Yemen said on Wednesday it would keep the Houthi-controlled Hodeidah port, vital for aid, open for a month despite a fresh missile attack against Riyadh, but it kept up air raids that killed at least nine people. The Western-backed coalition, which controls Yemen's airspace and port access, said last month it would allow humanitarian relief through Hodeidah following a nearly three-week blockade imposed because of a missile attack toward the Saudi capital's international airport. The Saudis say the Red Sea port, which is Yemen's main entry point for food and humanitarian supplies, is also a hub used by the Houthis to bring in weapons, which it accuses Iran of supplying. Tehran denies the charges. On Wednesday, the coalition confirmed it would keep access open to the port despite another missile attack at Riyadh on Tuesday by the Houthis which Saudi forces also intercepted. 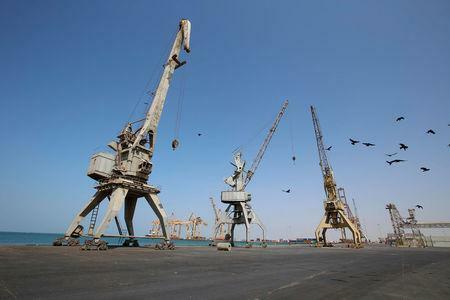 The Saudi ambassador to Sanaa said the coalition would also allow the provision of four cranes to the port to boost aid deliveries to the war-damaged country. The ambassador, Mohammed al-Jaber, who was speaking in a televised news conference, did not give details on how the cranes would be delivered. Earlier this year, the United Nations said the coalition turned back four cranes the United States donated to the World Food Programme to boost aid operations at Hodeidah. The cranes would have replaced parts of the port’s infrastructure destroyed by coalition air strikes in August 2015, damage that forced ships to line up offshore because they could not be unloaded. Saudi state news agency SPA said King Salman discussed in a telephone call with U.S. President Donald Trump ways "to hold the Iranian regime accountable for its hostile acts and its involvement in supplying the Houthi militia with missiles to threaten the security of the kingdom and the region". The White House later confirmed the call and said the two leaders "agreed on the importance of reinvigorating a political process to end the war in Yemen" and that the king briefed Trump on a Saudi plan "to alleviate the humanitarian crisis" caused by the conflict. Tuesday's missile attack took place as the Houthis marked 1,000 days since the coalition intervened in the Yemen war in March 2015 to try to restore President Abd-Rabbu Mansour Hadi after a Houthi advance on his base in Aden forced him to flee. Saudi Arabia said that since the war began the Houthis had fired 83 ballistic missiles toward the kingdom. More than 10,000 people have been killed and a humanitarian crisis unleashed in a conflict which has intensified since former President Ali Abdullah Saleh was killed on Dec. 4. Residents also reported that coalition aircraft bombed a new parliament chamber, part of a government compound being built in Sanaa, causing damage but no casualties.